And now for something completely different... In honor of MLB Spring Training, and because these two pieces (here and here) by Tommy Tomlinson got me nostalgic and excited, here's a piece I wrote this fall when Chipper Jones retired after 19 years with the Atlanta Braves. It also just helps explain my spiritual human magical powerful connection and love for sports and communities. The land of the free and the home of the Braves. It seemed completely logical to me. In first grade, when we stood up and Whitney's iconic version sparkled over the intercom, she was singing about Klesko, and Javy, and the big three - Glavine, Smoltz and Maddux - and of course, Chipper. I don’t remember ever learning about Larry Wayne "Chipper" Jones, Jr. No, I simply knew him, which leads me to believe that he was the first pro athlete I ever knew like that, one name representing one face representing one city. Chipper looked chipper, from his toothy grin to his crinkly eyes, and he belonged to the city of Atlanta. It was a fact in my brain just like my name or my street. That was that. And through my childhood as I grew up, so did Smoltzie, and Glavine, and Maddux, and Denny Neagle and Andres Gallaraga and Andruw Jones and Javy… And there was that awkward stretch with John Rocker… But ultimately, they all left. I remember with each trade or free agent's decision, I felt betrayed (well, not with Rocker) and devastated because they were our guys, our team, and it wasn’t right that they were leaving. Some, like John Smoltz, were especially painful. But Chipper stayed and stayed and stayed. I got his autograph during my freshman year at Davidson when Gillian and I camped out (when we should have been studying for finals) at a table outside the 900 Room where we could see him sipping his beer and waiting to go down to the performance hall for the Southern Sports Awards. When he walked out, we bombarded him, babbling and smiling, and he obligingly signed my piece of scrap paper that I had ripped from a notebook. Chipper stayed and stayed and stayed. I never imagined he would leave unless he retired. And he didn’t. He stayed. He is so well-loved, you can tell every time he comes to the plate. You can feel the affection for this guy who has stayed in one place for his entire 20-year career, which is unheard of in nearly every major professional sport on the planet. What a special, special thing. 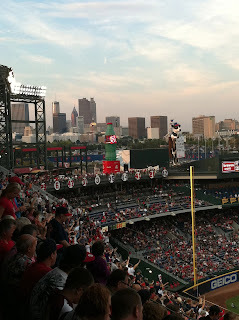 Friday night – Chipper Jones Night at Turner Field – will go down on my list of incredible sporting events that I’ve had the privilege of witnessing in person. I bet, I said to Mom and Dad, that at least one person who was at my first major league game at Fulton County Stadium in 1995 is here at this game now too. That sense of connection is something I cannot get away from and wouldn’t want to. I love seeing the specks that are people in this sold-out crowd and thinking that I have probably crossed paths with some of them on other game days from the past. I know that people I know, like David and Rachel and Jeff and Bethany, were there too. And we know the history, we share the history. When Bobby stood up to speak and the theme from The Natural boomed on the speakers, it felt that magical. We stood up, we bowed down. Then Hank stood and gave Chipper a gift, and we roared. And finally Larry Wayne Jones Jr. himself took the podium and we were thunderous. It is SO COOL to me when a collective body of humanity comes together and knows WHY they are together and WHAT it means to be together and what WE can do together to bring power and significance to this night. That is what gets me about any sporting event, really, but especially moments like these. It is a time when we as humans who think differently and live differently and come from different times and places come together and use our power and voices for good – and we have this collective memory that matters and because it matters to each of us it becomes even more powerful than one person could have ever imagined. That is true with Davidson basketball, with Harry Potter, with Election Night 2008, with the Olympics (these are my specific moments and memories - what are yours? )… We claim someone because we are drawn to them, because they represent something to us and we grow to love them as a person and a symbol. Which is what Chipper experienced when he stepped onto the field that night and this entire weekend. When he came to bat it was amazing – as “Crazy Train” boomed, we all screamed and yelled and held up our “10” signs and it was us, together, for him, thanking him, because he is a great player, yes, but also, mostly, because he stayed. When I was eight, the Braves won the 1995 World Series on my birthday. I turn 25 in eighteen days. Chipper has been around for what feels like all of it and basically is. And he is a huge contributing factor to my love and appreciation of sports today. I listened to the final home game of the regular season on the radio today driving from Atlanta to Charlotte. It was cool to imagine what I had already seen in part on Friday night – the cheers, the sold-out crowd, #10 doffing his cap over and over. But to hear Jim Powell call the end of the game, with the pent-up anticipation of Chipper’s last moments on the field, it was shiver-inducing. It wasn’t just, here’s the wind-up and the pitch, it was, and Chipper is smoothing out the dirt in front of third base that is already smooth. He was the center of attention even on the third base line. I liked knowing that I will remember where I was on this day, driving as far as Greenville and still getting a weak signal of the game, coming up over a hill and sensing that moment, still feeling Friday's celebration in my bones, and yet knowing that when the final out was called, nothing will ever be quite the same again. I love the way you weave sports and communities together. Sports definitely do transcend the boundaries that separate us far too often. 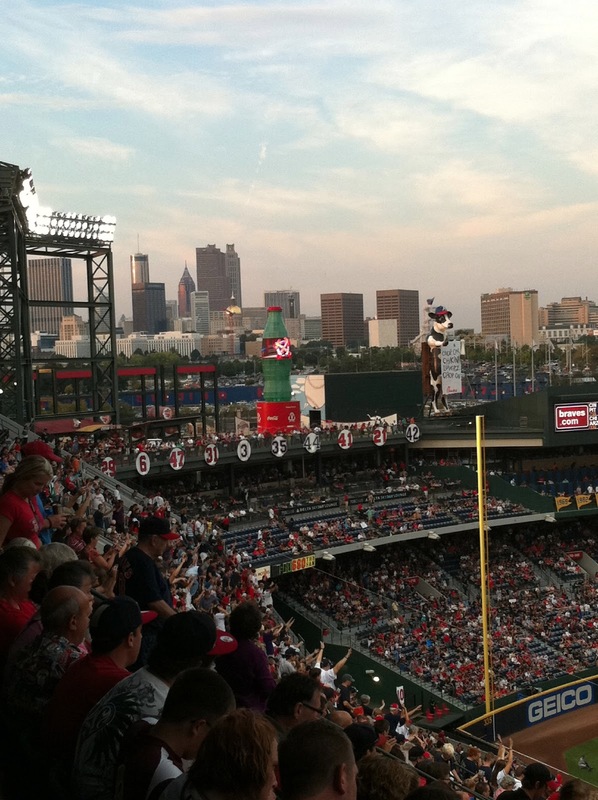 Thanks for sharing the night of Chipper's final regular season game with me (and 50,000+ other Braves fans).